I’m reflecting on everything Sergio Marchionne did for Fiat and Chrysler during his run as CEO of both companies. He received a lot of controversy in recent years, especially when he took control of Chrysler, but when I look back on a lot of his achievements, I think he deserves a lot more praise than he gets. First off, and most importantly to me, he brought back Alfa Romeo from near death. Around the time that FCA was established, Alfa Romeo was slumping in sales and respect across the board. While cars like the Giulietta and MiTo were quite well received, no one bought them, preferring their German and Japanese rivals instead. Sergio decided to take control of his new American allies and established a plan to bring Alfa back to the states with a completely new image, beginning with the 4C, and mostly spearheaded by the Giulia and Stelvio. Now sales have been on the rise mostly, and Alfa Romeo is mostly back to being profitable. I also think the Giulia is the best model to come from his tenure, but that’s besides the point. He managed to keep Chrysler floating along with the one invention that made them the king of the 80s: the minivan. Frankly put, Sergio made minivans cool again with the Pacifica, a minivan that looks just as great as the way it functions as a whole. I see more and more of them on the road every day and it makes me happy to see that Chrysler still manages to stick around, even with only two cars on the lot. Back in 2011, Dodge was in somewhat of a strange spot, trying to be a badass brand but still pushing basic models like the Avenger and Grand Caravan, making them more of a white collar basic brand along the lines of Chevrolet. When FCA came to fruition, this changed completely, especially around 2014 when models such as the Avenger, Grand Caravan, and Ram were either killed off or cut separate, leaving Dodge to flare their nostrils and become what they wanted to be: a performance-oriented brand. Yes, there are still base model Chargers and Challengers out there, but they now look the part, and we can’t ignore the obvious performance models they’ve pushed out. Plus, he brought the Viper back to us...the ultimate power move. The basic point: Dodge got its groove back. While he was head of Fiat as far back as 2004, his position also allowed him some eye into the affairs of Ferrari, but not much until FCA took control in the early 2010s. While under him, Ferrari managed to produce some historic models such as the 458, F12, and the amazing LaFerrari. His biggest contribution to the brand, however, might be his decision to separate the brand into its own entity for market purposes, allowing Ferrari to flex their wings a bit more than before. 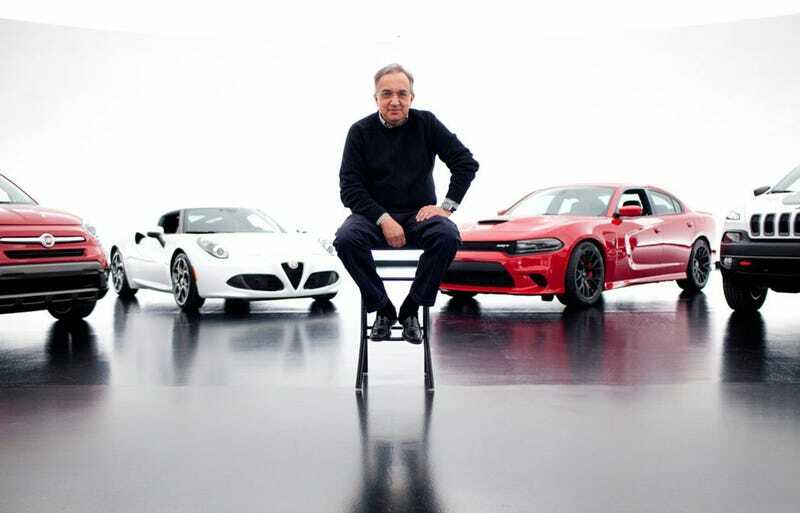 Along with Alfa Romeo, Sergio’s biggest help came to Fiat, which he decided to turn around from another basic compact company to a lifestyle company within the mid-2000s. He oversaw the lovely return of the 500, which especially came into Fiat’s favor when he greenlit their sales in the United States, where you can now see 500s everywhere. One 500L and 500X later, now Fiat’s booming with profits, and showcases a bright future with the 124 Spider. While Jeep was by no means suffering when Sergio came to town, they definitely needed a little R&D to bring them back to the limelight of glory they once had. The overall expansion of the brand, with models such as the new Cherokee and Renegade, and the much beloved revamped Compass, have helped Jeep gain a lot of ground in the SUV market, with many new customers finding a lot of Jeeps just perfect for them. Plus he managed to keep the Wrangler a thing, which is always good. Maserati hasn’t had the easiest life since the early 2000s, and while their image at the current moment may not be the best, FCA’s help has done at least a little good. The best thing possible that could have been done for them is probably the new, expanded dealership network, which allowed more people access to these saucy Italian machines than before. I’ve certainly seen more Maseratis on the roads than before FCA was a thing, and it’s all down to the new dealership that opened up in my area. I hope they manage to break out of the slump soon, and I think they might with the Levante and others in the future. And finally, Ram...probably the most bread and butter of the FCA tree next to Jeep. Under FCA, Ram has flourished with a completely new attitude (the MURICA attitude, if you want to call it that), and it’s really helped their overall image. Models like the Rebel have opened up new markets once dominated by brand such as Ford, and finally this year we’ve seen a long awaited revamp of the old truck, which I know will be a huge hit, just because of what it is. So, in final, Sergio has done a lot for us. He’s helped a lot of our favorite brands come back to life and profit once again, and while the products may not be the /finest/ in the industry, and while we may have lost some brands and much beloved models along the way, they gained back a lot of the soul they started with.